The R-PLEX Human VEGF-D Antibody Set includes a matched capture and detection antibody pair and calibrator for the quick and easy measurement of VEGF-D in biological samples. R-PLEX products leverage MSD’s electrochemiluminescence technology for better sensitivity and a larger dynamic range than traditional ELISAs. R-PLEX matched antibody sets enable the development of singleplex and multiplex immunoassays. Individual assays may be developed using MSD avidin- or streptavidin-coated plates. Custom multiplex assays with any combination of R-PLEX analytes, as well as R-PLEX plus U-PLEX analytes can be developed on U-PLEX MULTI-SPOT plates. To learn more about the advantages of R-PLEX products click here. 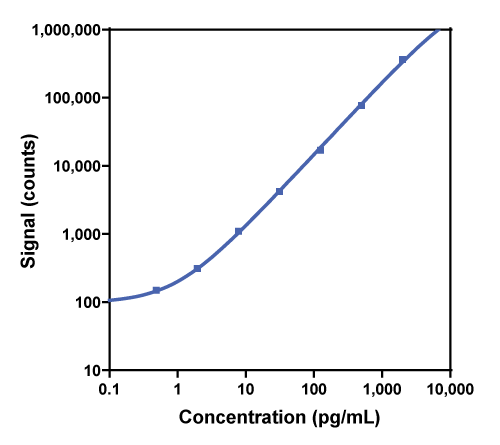 Calibration curve for the R-PLEX Human VEGF-D Antibody Set was assessed and representative data is presented below. Description - Vascular endothelial growth factor-D (VEGF-D, FIGE, c-Fos-induced growth factor) is structurally and functionally related to VEGF-C. Like VEGF-C, VEGF-D is a ligand for VEGFR2/Flk-1 and VEGFR3/Flt-4 receptors. VEGF-D is a growth factor active in angiogenesis, lymphangiogenesis, and endothelial cell growth, stimulating their proliferation and migration; it also affects the permeability of blood vessels. VEGF-D helps in the formation of the venous and lymphatic vascular systems during embryogenesis and in the maintenance of differentiated lymphatic endothelium in adults. R-PLEX Sets are intended to be used with other MSD components such as plates, diluents and MSD Read Buffer. If you don’t already have these items, you can purchase them along with your Antibody Set(s). The “Recommended Components” tab provides helpful suggestions or you can call MSD Customer Service 1-240-314-2795 for assistance. R-PLEX Sets can also be used with other antibody sets such as U-PLEX antibody sets for multiplex measurements. MSD diluents are formulated with optimized blends of buffers, blockers, proteins, and detergents. Assay diluents are designed to reduce sample matrix effects and can be used to dilute calibrators and samples. At least 50 mL is needed to run 5 plates. Antibody diluents are formulated to minimize non-specific interactions for optimal detection antibody performance. 40 mL is needed to run 5 plates. Additional assay diluent is necessary for samples that are diluted greater than 10-fold. Diluent 100 may be used in place of assay diluent for samples that require high dilution. MSD GOLD Read Buffer catalyzes the electrochemiluminescence reaction and is provided at the working concentration of the assay. We recommend you have at least 90 mL to run 5 plates. Read buffer is included in U-PLEX development packs. MSD recommends Small Spot Streptavidin plates for singleplex R-PLEX assays, and U-PLEX Development Packs for multiplex R-PLEX assays. Other streptavidin- or avidin-coated plates may be considered for singleplex assays. For more information, refer to the MSD GOLD Streptavidin and Avidin Plates product insert. Usage Statement For Research Use Only. Not for use in diagnostic procedures. Storage Statement(s) Please refer to the product insert for the storage conditions of individual kit components. Please enter a quantity for the product size you would like to add to cart. Error detected: MSD has transitioned this product to a status of “made-to-order” with a minimum order size of 25 plates. For an order of the 5-plate pack size, the minimum quantity is 5 packs (25 plates). 5:00 a.m. to 8:00 p.m.